Agrandir les images pour observer le ballet des caractères différents, majuscules ou minuscules, hauts de casse ou bas de casse, soulignés, gras ou italiques. On a l'impression que le document devait à tout prix dépasser huit pages et s'adressait à des illettrés. b) It does not specify the factual and legal grounds that justify the decision. c) The grounds are in opposition to the decision or there is some ambiguity or obscurity that turns the decision unintelligible. 4 - The nullities mentioned in points b) to e) of paragraph 1 can only be argued before the court that delivered the sentence if this one does not admit ordinary appeal, and if it does the appeal can be based on any of these nullities. 1 - The provisions of articles 613 to 617 are applicable to the 2nd instance, but the ruling is still null and void when it is drawn against the unsuccessful party or without the necessary salary. 2 - The rectification or amendment of the judgment, as well as the plea of nullity, shall be decided in a conference. And this in particular as regards the conclusive epitome on the protection of the rights of the appellants to their good name and reputation, and their intimate relationship with the presumption of innocence or, if we wish to be more rigorous, the status of innocence that they enjoy. 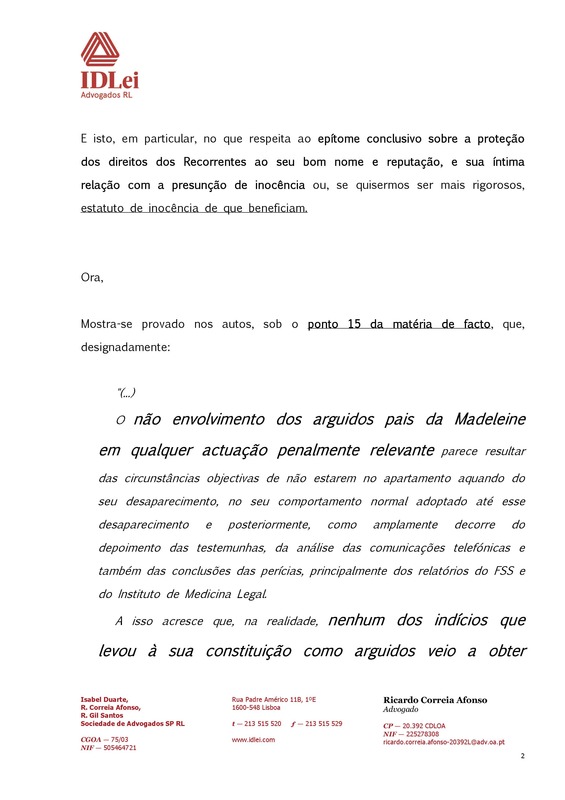 It appears that the non involvement of the parents, arguidos (formal suspects), in any penally relevant action stems from the objective circumstances of them not being inside the apartment when Madeleine disappeared, from the normal behaviour that they displayed until said disappearance and afterwards, as can be amply concluded from witness statements, from the telephone communications analysis and also from the forensics' conclusions, namely the reports from the (Birmingham) Forensic Science Service (FSS) and from the National Institute for Legal Medicine. To this should be added that in fact none of the clues that led to their constitution as “arguidos" was later confirmed or consolidated. 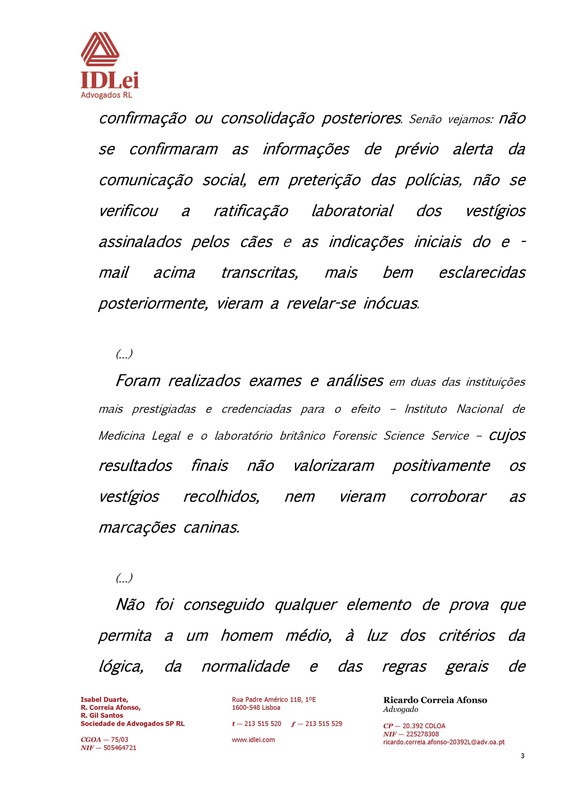 Let's judge it : the information concerning a previous alert of the media before the police was not confirmed, the residues that were marked by the dogs were not corroborated in laboratory, and the initial indications from the above transcribed email (2) better examined afterwards, that ended up appearing to be inconclusive. Tests and analyses were performed in two of the most prestigious and credentialed institutions - the National Institute for Legal Medicine and the British Forensic Science Service -, their final results having neither positively evaluated the collected residues nor corroborated the dogs' alerts. (2) The email on the preliminary DNA analysis by the FSS of the samples collected in the car hired by the MCs. (3) (...) is substituted to "In spite of all this" in the original document (the filing order). to formulate any lucid, sensate, serious and honest conclusion about the circumstances under which the child was removed from the apartment (whether dead or alive, whether killed in a neglectful homicide or an intended homicide, whether the victim of a targeted or opportunistic abduction), nor even to produce a consistent prognosis about her destiny and inclusively – and that's the most dramatic - to establish whether she is still alive or, as it seems the more likely, she is dead. 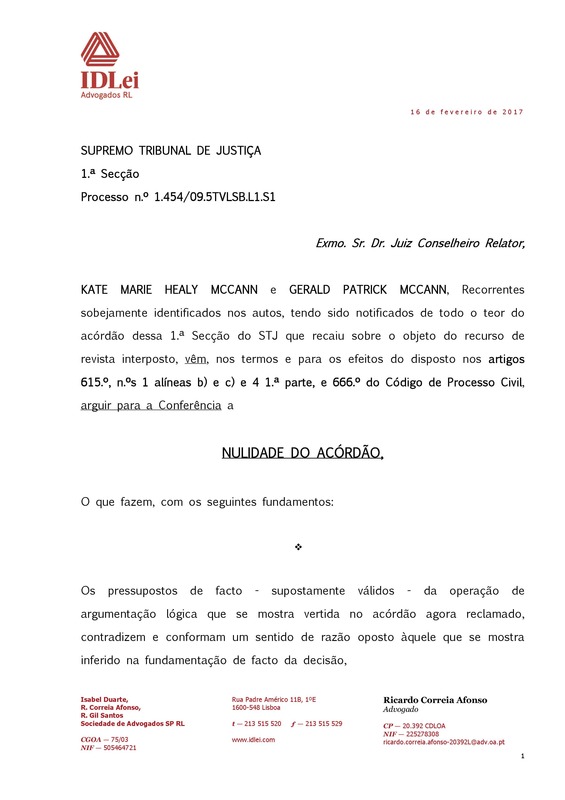 the archiving of the autos concerning the (by lawyer) assisted witnesses Gerald Patrick McCann and Kate Marie Healy, due to the lack of clues of their practising any crime. (cf. also alinea AQ) of the established facts in the normalizing dispatch of the process). The documentary proof that supported the determination of this fact as proved, even in the condensation phase of the proceedings, is, as a result, the order to file the aforementioned criminal investigation, together with the minutes on paper or in digital form. 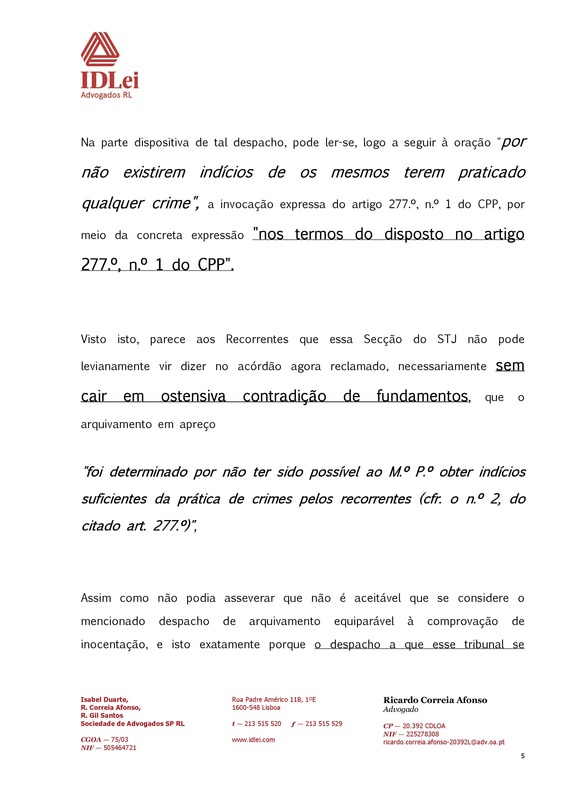 In the operative part of this order, one can read, immediately after the sentence "because there is no evidence that they have committed any crime", the express mention of article 277-1 of the CPP (Code of Penal Procedure) (4), through the concrete expression "in accordance with the provisions of article 277-1 of the CPP". In the light of this, it seems to the appellants that this STJ's Section can not lightly come to say in the ruling now matter of complaint, necessarily without falling (5) into a conspicuous contradiction of grounds, that the archival in question "was determined since it had not been possible for the Public Ministry to obtain sufficient evidence of the commission of crimes by the appellants (cf. quoted article 277-2)" (6). 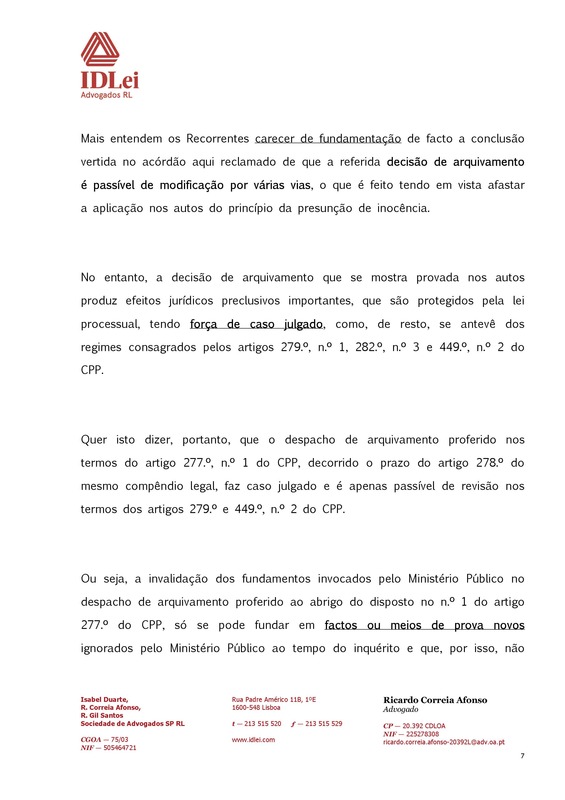 1 - The Public Ministry shall, by dispatch, close the investigation, as soon as it has gathered sufficient evidence that the crime was not confirmed, that the arguido did not practice it in any way or that the procedure is legally inadmissible. 2. The investigation shall also be closed if it had not been possible for the Public Ministry to obtain sufficient evidence confirming the crime or who were the authors. as a presupposition of the conclusion it reached, does not unexist (7) uttered under article 277-2 of the CPP. 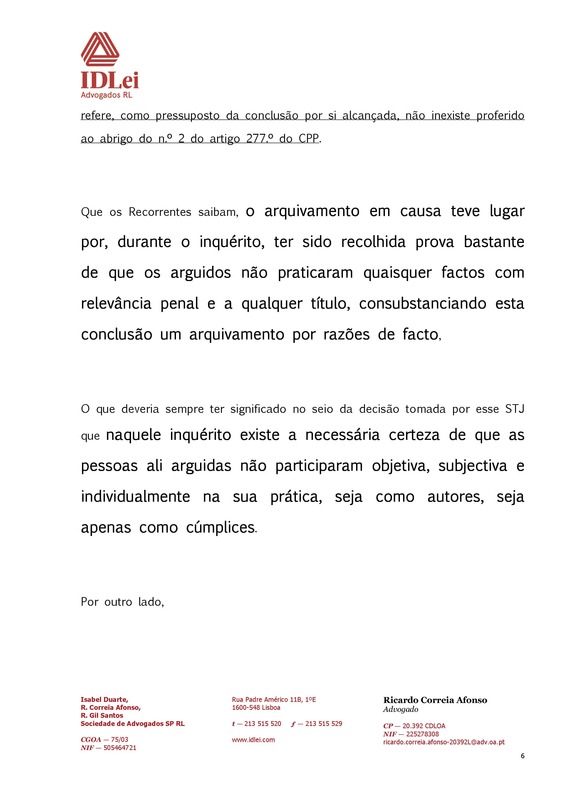 A point that should have always meant inside the decision taken by this STJ that, in this investigation, exists the necessary certainty that the persons then arguidos did not participate objectively, subjectively and individually in its (8) practice, whether as perpetrators or only as accomplices. (8) This possessive adjective lacks syntaxic representation. One can guess that it refers to the undetermined crime MMC was victim of. Furthermore the appellants find that the conclusion reached in the ruling under complaint is lacking factual ground concerning the fact that the alluded filing decision is liable to be amended by various means, which is done with a view to removing from the minutes the application of the presumption of innocence principle. That is to say, therefore, that the filing order uttered according to article 277-1 of the CPP, after the deadline of article 278 (10) of the same legal compendium, is res judicata and is only subject to review according to the terms of articles 279 and 449-2 of the CPP. 1. Once the period referred to in the previous article has expired, the investigation may be reopened only if new evidence appears to invalidate the grounds invoked by the Public Ministry in the filing order. 3 - If the arguido complies with the injunctions and rules of behaviour, the Public Ministry closes the processs that cannot be reopened. 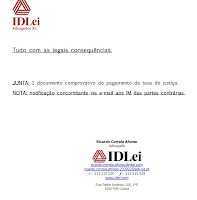 2 - For the purpose of the provisions of the preceding paragraph, the dispatch terminating the process shall be equated with the sentence (made res judicata). 1 - Within a period of 20 days from the date on which the opening of the investigation can no longer be requested, the immediate superior of the Public Ministry magistrate may, on his own initiative or at the request of the assistant or of the complainant capable of being constituted assistant, determine that an indictment is made or that the investigations continue, indicating, in this case, the steps to be taken and the deadline for compliance. 2 - The assistant and the complainant able to become an assistant may, if they choose not to request the opening of the instruction, raise the hierarchical intervention, under the previous number, within the period provided for that request. (11) Read “only new pertinent elements will be able to cast doubt upon the grounds invoked by the PM". could not be presented and produced in order to be assessed and pondered in the decision. (12) The complexity of the filing order, erroneously known as the “AG Report”, is likely related to the difficult task the Public Ministry was facing. And one has to admit that the dispatch is not written as the judges of the STJ remarkably write their rulings. Mr Murat’s arguido status, twice extended, required to put an end to the criminal investigation (the status of arguidos can’t be removed before the end of that investigation phase). 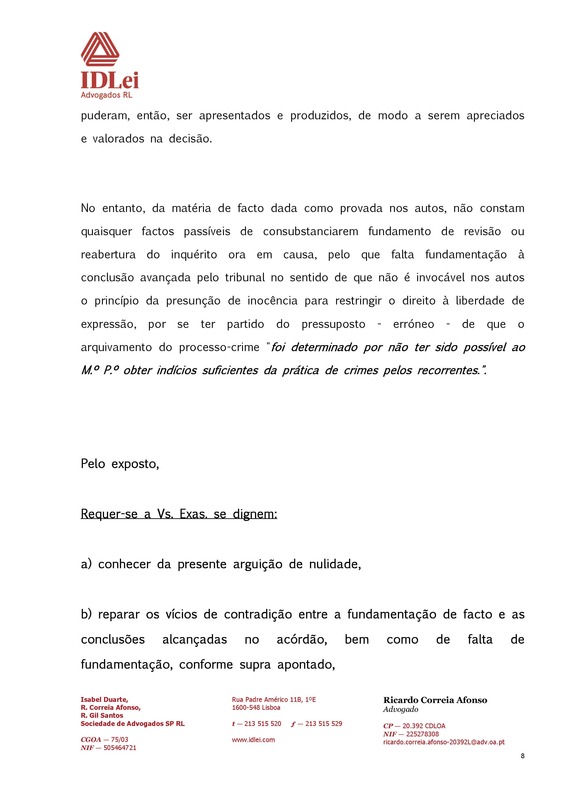 Furthermore the acquaintances of the MCs rejected the request of the Prosecutor to go back to PDL in order to be part in a reconstitution of the 3rd of May events, though the Prosecutor clearly warned that it was the last chance for boosting the rather stagnant criminal investigation. These are the significant circumstances involving the writing of the filing order. One has to acknowledge an important point however : the Prosecutors foresaw that their constrained decision, as it couldn’t exonerate the MCs, the crime being undetermined, would reflect the “major damage done to the MCs” by the refusal of the group to collaborate with the PJ. Attached is a document proving that justice fees were paid. 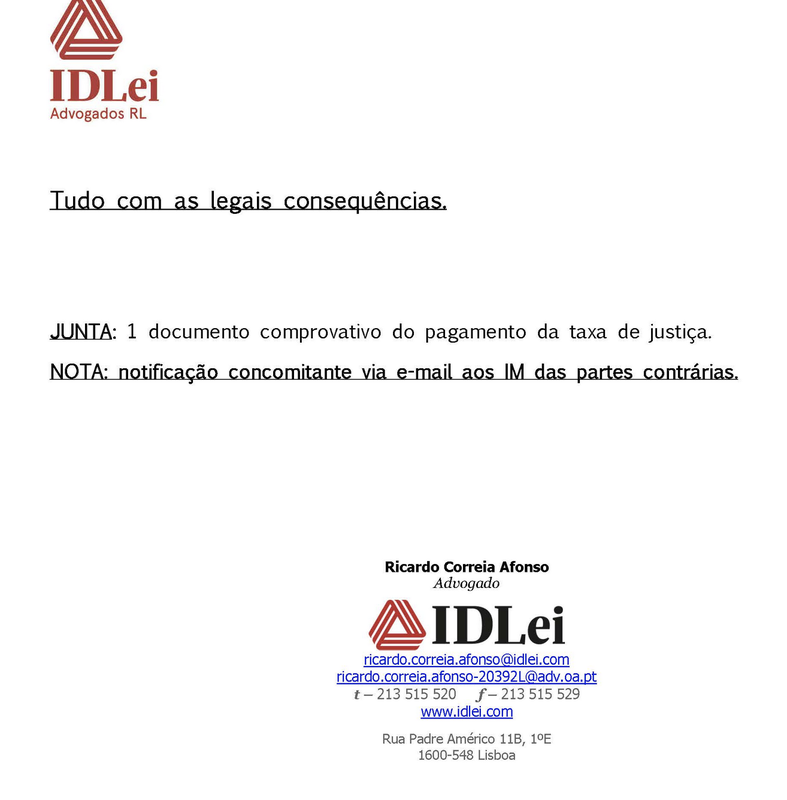 (14) This document was published on PJGA on March 18, but Gonçalo Amaral legal team is supposed to have been emailed it on February 16. The referred receipt of justice fees isn’t appended.